Avast, ye scurvy dogs! The Oscar nominees were announced yesterday, which means it’s time again to revisit the eternal war between the MPAA and Internet movie pirates. View full-size on Google Spreadsheets. Since 2003, I’ve tracked the online distribution of Oscar screeners, and every year, the piracy scene manages to release nearly every film by nomination day. Last year, all but three films were leaked in DVD quality by nomination day. The tide may be turning. There’s still a month out before the Academy Awards, but so far, fewer Oscar screeners leaked online this year — only 14 out of 34 nominated films, the lowest percentage ever. And they’re taking twice as long to leak — a median 21 days after theatrical release, up from 11 days the previous year. 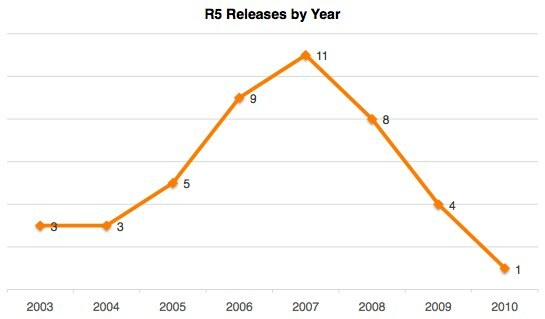 And the R5 DVD releases that dominated previous year’s Oscars is now mostly dead. I’m guessing the studios are moving away from the early distribution of R5 DVDs entirely. But why the shift this year? Are studios doing a better job protecting screeners and intimidating Academy members? Or was this year’s crop of films too boring for pirates to bother with? I can’t tell if this is a scene-wide trend or localized to the Oscars only. If you have access to historical data tracking scene releases, get in touch. And if you have any theories or inside information, leave a comment. Academy members received screeners for 30 of the 34 nominated films. The Avatar screener was the last to be received by Academy members (Ken Rudolph received his on January 15). Amazingly, it hasn’t leaked online yet. February 4: It leaked today. The Hurt Locker and The Young Victoria were both leaked online in DVD format over six months before their theatrical release. As far as I can tell, The Secret of Kells is the first film since I started tracking to be nominated without a U.S. theatrical release. It’s currently slated to come out in March. As usual, I included the feature films in every category except documentary and foreign films (even makeup and costume design). I used Yahoo! Movies for US release dates, always using the first available date, even if it was a limited release. Cam, telesync, R5, and screener leak dates were taken from VCD Quality. I used the first leak date, with the exception of unviewable or incomplete nuked releases. Finally, the official screener dates came from Academy member Ken Rudolph, who lists the date he receives every screener on his personal homepage. Thanks again, Ken! For previous years, see 2004, 2005, 2007, 2008 (part 1 and part 2), and 2009. Fascinating – I was going to say something about the neutering of the Pirate Bay and the growth of private BT sites, but (without being familiar with VCD Quality) doesn’t seem like that would impact your stats. Would be interesting to contrast this list of the Oscars with a similar list of the year’s top grossing films. Seems bizarre that no one has posted Avatar yet. My friend, an Academy member in Canada, received only a very limited number of screeners this year, the lowest ever. No “A Single Man”, no “Avatar” (better seen in 3D IMAX anyway), and various other glaring omissions. So maybe the studios only send screeners to a selected list of (US?) members? And that is the cause of the low leakage-rate? Am I reading this right? The Hurt Locker DVD rip was out 5 months before the theatrical release? Alasdair Pearce: Thanks, I added it. Brian: Correct, the first DVD rip was January 22, 2009. The movie first debuted in Fall 2008 at film festivals, so I’m guessing the DVD was originally intended for distributors or review. I’ll reclassify it as a screener leak, since it’s definitely not a retail DVD. You have the screener release of Avatar as 1/15/2009, but I’m guessing you meant 2010. I think it’s a little bit too incredible, though. While 2008 and 2010 (so far) both have low percentages of leaks (~50% compared to more like 80%) 2010’s leaks are not yet over considering that a significant portion of leaks each year happen hundreds of days after the release. Moreover, the graph “Median days…” appears to show a very interesting trend, but that’s because it obscures the massive variability in how long it takes to get a leak. A more accurate graph, like a box and whisker graph of each year, shows how that little bit of change is really insignificant to the point of not being worth talking about. This is definitely a fun data set, but I don’t think it’s as incredible as what you’re suggesting. I would bank even more on the demographics of those people who pirated as much as possible either growing into an income, less time available for the process, or the proliferation of free content on the web that seems to look like television from 20 years ago. Mainly we’re seeing ads, but there aren’t as many, and they’re kept in check by the option for those to go back to piracy if they feel they’re being scorned. You’re exactly right about Avatar. I hang at four different bittorrent sites and every time the screener gets uploaded it gets yanked because it’s some dork trying to pass off a cam copy. Then I saw the comment from molgar, checked again and saw over half a dozen different rips on just one torrent site. Thanks for all this work you do. Fascinating really, to see all the data side-by-side. The Hurt Locker was released in Europe a lot earlier than in in the US I’m pretty sure the rips available before the US release were retail DVDs and Bluray (at least mine was). As mentioned above, while I don’t know if it can explain the lack of DVDscr rips, the HD x264 scene has really exploded over the past year. Most people I know are waiting for quality. at least 25 (not 14) – including several recent Avatar screeners this week – from the list have had at least 1 screener version shared online. and i do wish people would stop referring to p2p as pirating. if anyone is a pirate, it’s the academy members who continually produce crap product, relying mostly on remakes (how many were nominated? oh that’s right…ZERO!) and buying (stealing) other peoples’ ideas. Il Divo was leaked long ago for sure (DVD). I can not tell you the exact date, but by the time A.O. Scott reviewed it on the NYTIMES (april 2009), it was already online. The Secret of Kells is online too (piratebay, there are a few copies). Where are you getting the data for the “leaked date” from? Things are generally available long before there are torrents. I think I’m not alone these days in waiting for a proper BluRay rip in 720 or 1080p. Of course having the movie early is fun, but it also means having that ‘early access rush’ spoiled by it being a crappy blocky XviD. Barrett: My sources are listed in the Methodology section at the end of my post. Cam/telesync/screener/DVD rip dates come from VCD Quality. Are you differentiating between DVD screeners and low quality VHS screeners? Those make a world of difference and you should account for that factor. Andy: VHS screeners have fallen out of favor entirely. I doubt most Academy voters even have a VHS player anymore. Wow! !..something must be done to stop these piracy! Its not good for the industry. I watched Il Divo and Kells the other day. They’re both out. NINE is out now too. I wonder (in a sort of lazy web request way) if part of the drop could be explained on how popular the films that were nominated were at the box office. When you first began this study, web video+torrents were still in their infancy. If anything, the availability of foreign, independent, and older content has skyrocketed. Major production house media is still available rather quickly, however it now faces greater competition and is no longer able to maintain a stranglehold on our attention. When you state “Or was this year’s crop of films too boring for pirates to bother with?” you are likely hitting very close to home …. Interestingly “The Last Station” which is actually the cream of this years crop is not to be found …. A Single Man,The Last Station and Crazy Heart are the only contenders that haven’t been leaked.. I have a feeling that pirates are following the general trend of media consumers and demanding higher quality, higher resolution content. This means that there is less of a proclivity at this point towards early access to low quality material just to get it out the door, but rather to have patience and be the first to release something that is good, preferably in HD. This hypothesis could easily account for the shift. Re: Hurt Locker’s super early release: I think it actually had a RETAIL release in Brazil (?) long before the theatrical release in North America. This would explain the “leak”. Also, I know this is more “scene” focused, but the p2p groups are getting stuff out there a lot quicker than Scene groups these days. That said, they tend not to be of the best quality… or as easy to track. But it still might be something you’d want to look into for next year. Seriously though, I find this whole topic fascinating and look forward to it every year. Can it be something about closer release dates in the US and elsewhere? I don’t know if it is true, just an idea. I heard your interview on CBC Spark today. A very interesting topic. There are so many factors involved, obviously, making it possible to only speculate on reasons for any given potential relationship. Regardless, it is appealing to see you attempt to put handles on an elusive topic. Thanks for your hard-work. I’ll bookmark your site and keep your work in mind. Do you know of the company, FSA, that is distributing Academy Screeners this year?